After a week indoors tending to a very ill Little Hiking Buddy while preparing for Big Hiking Buddy’s birthday party yesterday, I needed to lose myself in the mountains today. It didn’t matter that it was Superbowl Sunday and my husband’s favorite quarterback was possibly playing the final game of his career. I had to be where there were no walls to limit my spiraling energy. Hex Mountain promised not to contain me, so I undertook her challenge. 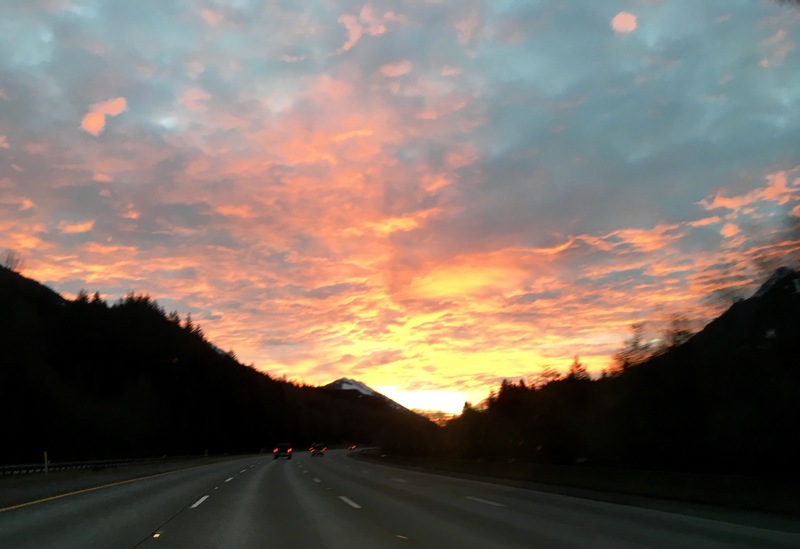 The drive east along I90 at first light was a sight to behold. Warm hues of salmon, coral and gold highlighted the colorless clouds, heralding a spectacular day ahead. If my 90 minute commute to Cle Elum was already this beautiful, I couldn’t imagine what else would be in store for the rest of my journey! 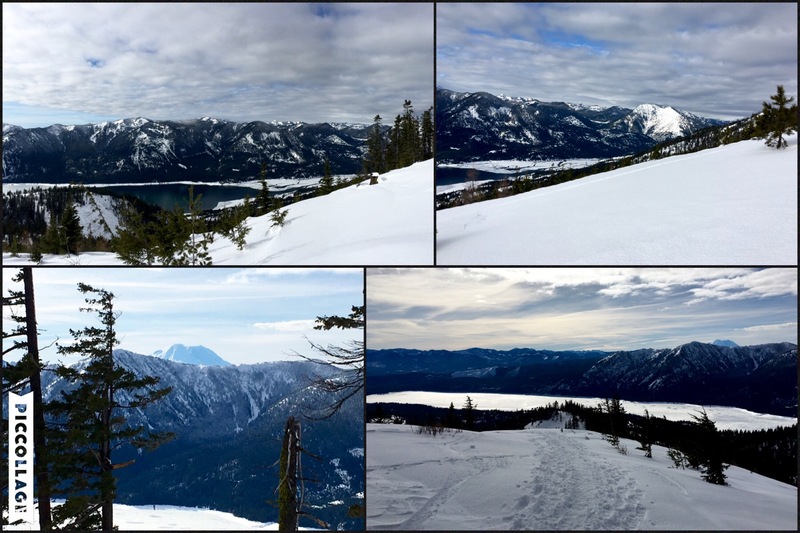 Located east of Amabilis Mountain, Hex Mountain can be found just off Cle Elum Lake in the Salmon La Sac/Teanaway region of the Cascades. I hadn’t been back to this area since last September, when I did my last long day hike of the PNW summer to Robin/Tuck Lakes, and I wasn’t looking forward to the mileage on the road. It was a very long drive then, but today’s sunrise above the snowcapped peaks made the trip feel so much quicker this time around. I was the first person to arrive at 8:30 am, but only by a few minutes. A caravan of cars made its way onto the off-street parking just as I headed up FR 116 to begin my snowshoe trek. I think we hikers all had the same idea: it was far too lovely of a day for anyone to spend the day inside. With a 3:30 pm kickoff, we would have plenty of time to get back to enjoy the game. A double win for the day. I began the first half of my snowshoe up an exposed forest road. From recent reports, I knew the snow was compacted from previous hikers. I strapped on my snowshoes just for the heck of it – well, truth be told, they were lighter to wear on my feet than to carry on my back. As I waddled up the curiously manicured road, I noted how it was meticulously lined with cedar, spruce and ponderosa saplings that had to grow beyond my line of sight. The view from the lower half was spectacular in the morning light. 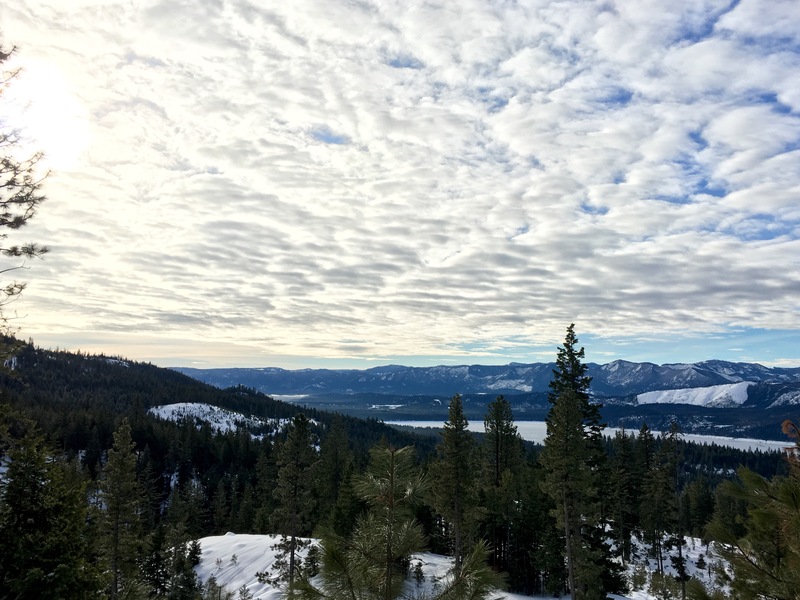 The variation of altocumulus clouds overhead extended far beyond the horizon, meeting the mountaintops overlooking Cle Elum Lake. From my vantage point, every layer of Earth’s surface was illuminated in this diffusion of light. It was absolutely breathtaking, yet I was only a quarter of the way up the mountain. With two miles behind me, I reached the summer trailhead of Hex Mountain (#1343). The entrance immediately signaled a change in the journey ahead, as the incline went from road grade to one visibly steeper than the staircase in my home. With 30 lbs. on my back, including an ice ax and extra winter essentials, I started my way up the hiking trail. This section of my journey was under a canopy of conifers that gracefully showed the way through the forest. With previous tracks still clearly defined, I easily passed between limbs of jade needles and trunks coated with chartreuse lichen that softly glowed in the sunlight. Following my initial foray through the forest, I came to a ridge that opened to a view of Hex Mountain above me. It was a reminder that while I was close, I was still 1000 ft. below my desired summit. The snow-covered path before me was just as steep, if not steeper, than the previous mile through the trees. As I looked down at my MSR Lightning Ascent snowshoes, I realized how useful the Televator(TM) technology was on this climb. Having taken small steps throughout the hike, my legs were still rather fresh considering the weight on my back and under my feet. For the first time in weeks, I knew I could make it to the top without any hesitation. The view behind me was amazing. Powder-coated crests lined the horizon to the east as far as the eye could see on this gorgeous day, with Mt. Rainier proudly rising above the near summits of the south as the frozen waters of Cle Elum Lake glinted in the morning sun. Ethereal. It was the perfect description for this moment in time. I couldn’t wait to see the view from the summit of Hex Mountain. 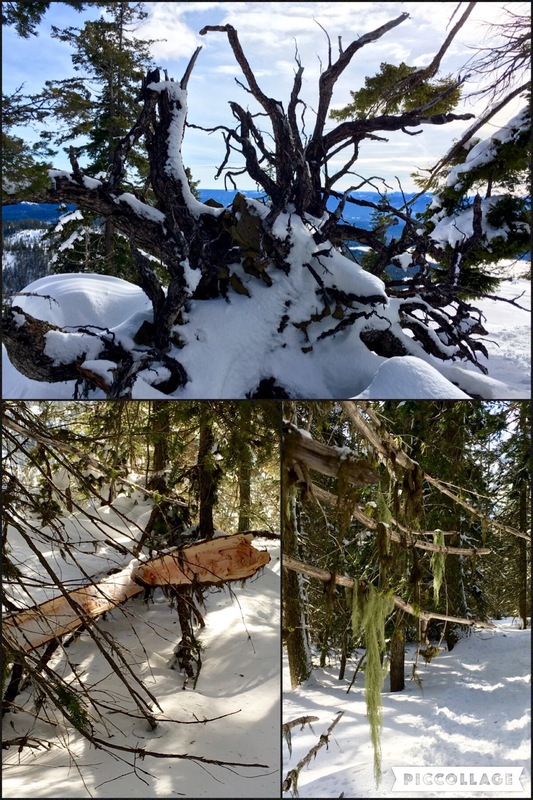 The last quarter-mile of trail followed the frost-tipped trees along Sasse Ridge. There were clear signs of past bear activity throughout the forest, with trunks shred bare of their bark and branches dangling snagged fur. After my encounter with a bear last year, I was extremely glad to hear human voices filtering up the trail from below me this morning. A quick climb up a wall of snow brought me to the smooth summit of Hex Mountain. I made it! Wow, I made it to this unbelievable setting. I had an unobstructed 360 degree view of the Cascades from north to south, east to west, all to myself. Mt. Rainier was even more striking from this elevation, while Mt. Stuart majestically crowned over the ranges to the north. This was by far my favorite view from the short list of summits I have had the privilege to sit atop. Just as I made myself comfortable on the summit, a lovely couple found their way to the peak as well. I enjoyed a great conversation with them about the view and weather, the Superbowl and Peyton Manning, and our travels near and far. This fun duo have journeyed to a great many places throughout the world, as well as hiked most everywhere within the State of Washington. Who would have imagined I would meet such interesting people at the top of quiet mountain. They thought it was cute that I was testing out my new JetBoil MiniMo – soon to be used on an upcoming trip to the desert, so stay tuned! Within minutes of set up, I was slurping on a steaming bowl of salmon ochazuke, a Japanese green tea rice soup, from the water I just boiled. This broth, along with my white chocolate mocha, was the perfect accompaniment to my incredible surroundings. Unlike the trudge up and down Amabilis Mountain last week, my return trip today was as scenic as my ascent to Hex Mountain. The afternoon sun made everything around me seem even more brilliant than in the early light. The green needles and brown pine cones were brighter, the indigo water of the lake more dazzling, and the snowcapped peaks vividly defined. This morning on the mountain completely renewed my soul. I was ready to share myself again with my loved ones. I couldn’t wait to get back home to show and tell them about the incredible day I had. I couldn’t wait to thank them for letting me once more. After an uneventful drive home, I walked through the door just in time for kick-off. I was greeted by my wildly exuberant family and welcomed by the delicious smell of chicken wings. With a plate full of goodness and a cold bottle of brew in hand, I finished my day watching the Broncos win the Superbowl within the walls of my comfort zone. What else is there to say? It was a fabulous Sunday.